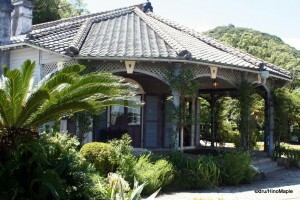 One of the better areas of Nagasaki is the Glover Park area. It’s a large area at the south end of Nagasaki itself. The area contains Glover Garden, Oura Catholic Church, and the nearby Holland (Dutch) Slope. The Holland Slope is something that can easily be skipped. It’s a nice place with lots of history. There are a few items of interest, but in reality, other than a few plaques and an old style road, it’s not special. The Oura Catholic Church is something that should be visited. While entrance to the church requires a fee, visiting the grounds outside is free. You can easily just walk around the outside and not worry too much. Inside, you will see a typical western style church architecture and art. 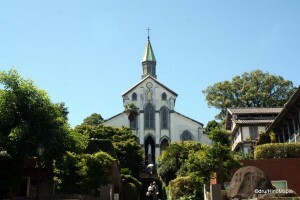 It is the oldest church in Japan and a national treasure. The inside of the church is not particularly interesting, but paying the fee means they can help maintain the church for historical reasons, at least I think so. Outside, you can learn a lot about the history of the Catholic Church in Japan. The church is dedicated to the 26 martyrs, Catholics who were crucified when Christianity was outlawed, and also the history of Catholicism during this period. You can see a few of the artefacts on how they hid their faith within Buddhism and Shinto. The outside ground of the church was quite interesting as you can see the Japanese influences on the surrounding gardens and their take on Catholicism. From the church, it’s a relatively short walk to Glover Garden. It’s a long way to the top of the hill, but when you pay the admission and get to the top, it’s a nice place to relax. If you are from outside Asia, you might not care too much for the park. There is a lot of history in this open air museum. You will see old buildings of the former government officials and other foreign dignitaries in Glover Garden. You will be able to see the history of Japan during the Meiji Restoration, I think. It’s the period of time when Japan was becoming westernized and leading up to the period before World War II. You can see Europeans in traditional Japanese clothes, and vice versa. While I didn’t care too much for the buildings, I will say that the entire park was beautiful and worth a visit. What you take from it will depend on your own personal mindset. If you keep in mind that the architecture will be more European with Japanese accents, you’ll be able to appreciate it a lot more. I was very surprised at how much I enjoyed it, but it wasn’t a top 10 in Japan. It was a must see for me though. Nagasaki has two places in two different “Japan’s Top 3” lists. The Top 3 list was created, in my opinion, to spark interest in various regions and promote tourism within Japan. Unfortunately, this has become so rampant that the top 3 lists are losing their value, and in all honesty, I don’t think some of them warrant a mention. For example, I mentioned earlier that the Nagasaki Chinatown was small and not very interesting, yet it’s part of the top 3 Chinatowns in Japan. In fact, Chinatowns in Japan are far from exciting. 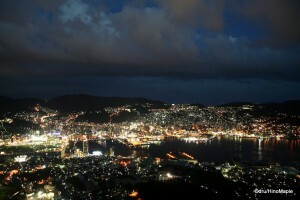 The second point of interest for Nagasaki, in terms of top 3 items, is the night view. Nagasaki is part of the top 3 night views, along with Hakodate, and Kobe/Osaka. I spent some time going to Mt. Inasa to check out the night view one evening. Going there, you have to go through the Fuchijinja (shrine). 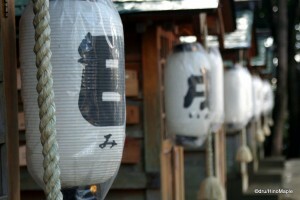 It’s a small shrine that is located next to the ropeway at the base of Mt. Inasa. The ropeway is, of course, the easiest method to access the top of the mountain. The shrine itself is beautifully set and there are some interesting smaller shrines just above the main shrine. They have 6 shrines dedicated to the 12 animals of the Chinese zodiac. It was the first time I had seen something like that in Japan, and I’d recommend a quick trip up to see these small shrines. To reach the top of Mt. Insasa, you have to either take the ropeway, or drive up to the top. When you go up to the top of Mt. Inasa, it’s nice to get their a little early to see the sunset along with the night view, of course. It doesn’t take long to take a few pictures and return back to Nagasaki. At the top, if you arrive a little late, in time for the sunset, there isn’t much to do. Most of the shops are closed before dinner, and to be honest, there aren’t many shops at all. I was surprised that a Top 3 Night View had so little in the way of things to do, and the ropeway closed early as well. I’d say it’s worth the trip to the top as the view is very nice. Whether I’d say it’s one of the best in Japan or not is debatable, but if something is recommended, why not try it. Nagasaki is a lot bigger than you can expect. You don’t have to do too much to get around and see everything. While you can walk around and see almost everything without using public transportation, I didn’t get a chance to see some of the other famous sights, such as the peace park, and a Chinese temple. It was a little far from the area I was staying in, but if I do go back to Nagasaki, those are two places that I will have to visit. I do think that visiting Nagasaki is an important place, and there is a lot more to do than you would expect. Whether you rush and do everything over a couple days, or take your time and spend several days there, you will leave very happy. This is Part II of a two part series on Nagasaki. To read more on Nagasaki, please head over to Part I. This entry was posted in Kyushu and tagged Catholic, Chinatown, church, Dutch Slope, Glover Garden, Glover Park, Holland Slope, Inasa, Inasasan, japan, Meiji Restoration, Mt. Inasa, Nagasaki, Nagasaki Chinatown, Nagasaki-ken, open air museum, Oura Catholic Church, Oura Church, Top 3, Top 3 Night Views, World War II, オウラ, 日本, 長崎, 長崎県 by Dru. Bookmark the permalink. Dejima is already on my list, but I’ve just added the 6 shrines of the 12 zodiac animals … plus the night view. I’d be quite happy to just sit there, vegetating, until night falls.